These past few weeks haven't been easy on me. I was torn between eating for nourishment and eating for pleasure. During this time, visions about me eating juicy burgers keep getting into my head, but I just brushed them off. I wasn't really able to address that craving until Team Kaladkarin's visit to Gilt Burger. 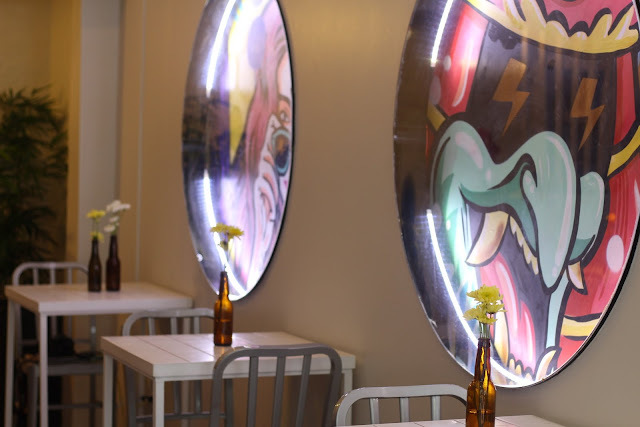 Gilt burger is a small and humble burger joint along Guijo street. 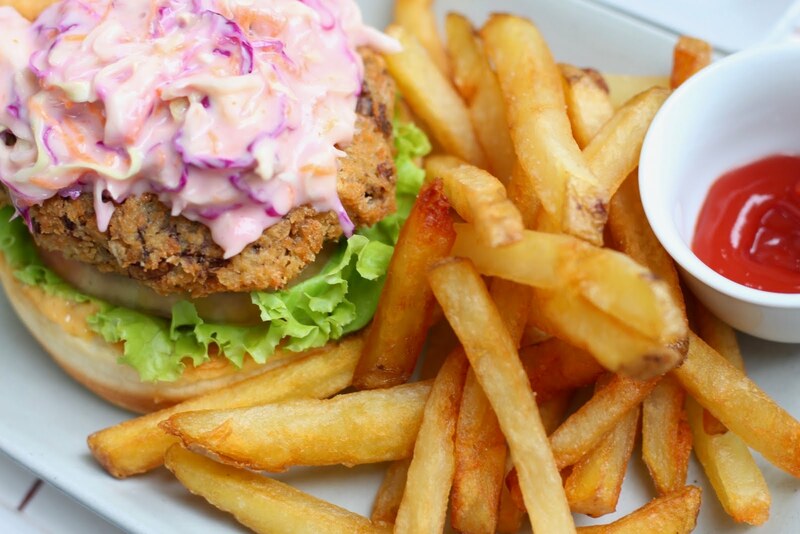 They offer a variety of innovative, internationally-inspired gourmet burgers, combined with a touch of locally-sourced ingredients. 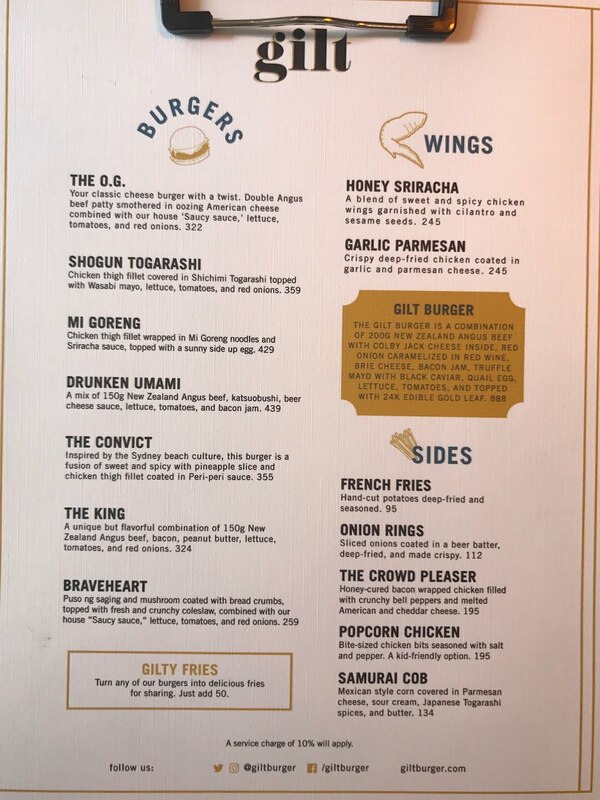 The burger joint's design is way awesome. It's hip and instagrammable, but also a bit puzzling. It's not easily noticed how contradicting the two sides of the interiors of this joint is, but when you do realize it, it's actually pretty interesting. It shows everyone's struggle of being torn between growing up and staying young and free. 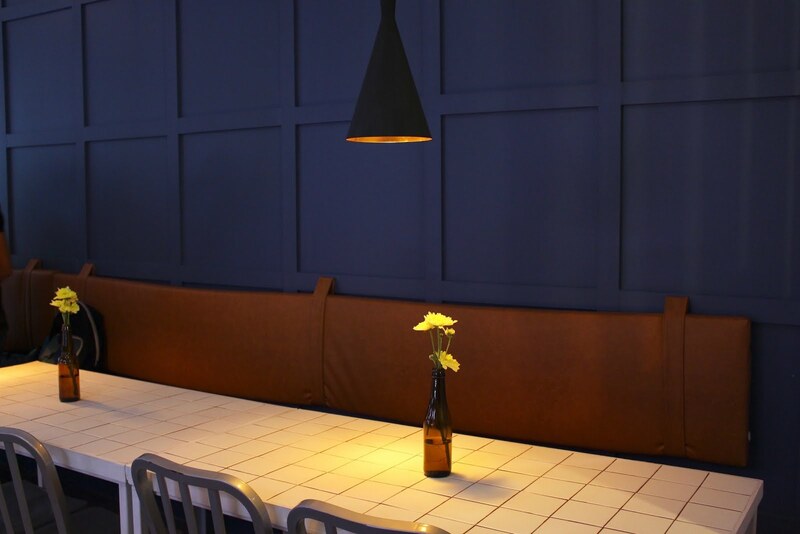 It's a statement of how we want to have the best of both worlds, which to me translates as Gilt Burger simply being a place for everyone. 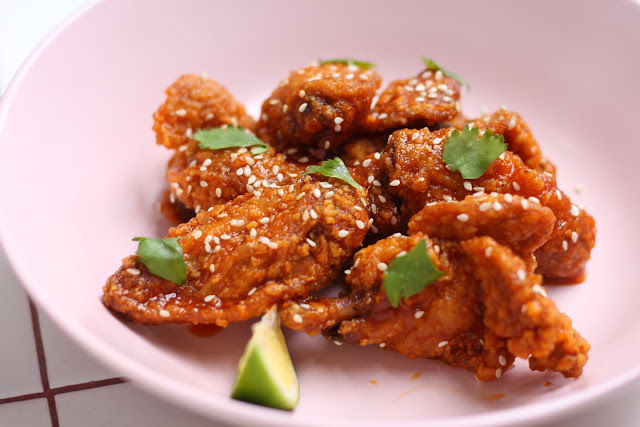 Gilt's menu isn't as extensive, but it offers a lot more than the burgers we know of. Each item on their menu has their own distinct flavors and elements. Double Angus beef patty with American cheese, Gilt's house "saucy sauce" lettuce, tomatoes, and red onions. Gilt's most basic burger doesn't seem so boring as how other burger joints prepare it, plus it tastes as good as it looks. The shogun togarashi is owner Alexa's best bet among all the items on their menu. It's a burger made of chicken thigh fillet covered in Shichimi Togarashi topped with wasabi mayo, lettuce, tomatoes, and red onions. 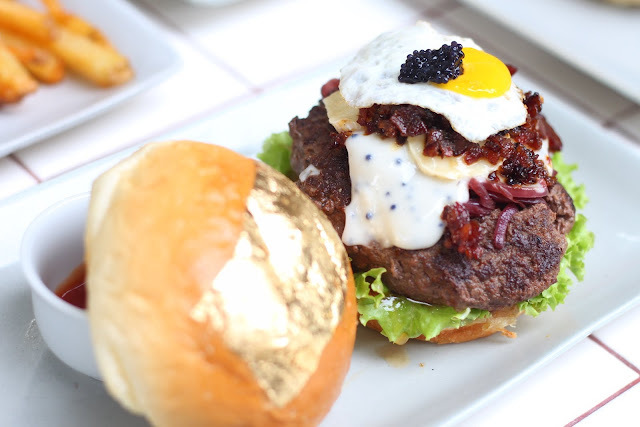 This burger won the hearts of the majority of Team Kaladkarin's members, myself included. There's something so perfect with how the chicken fillet was prepared that made me mention the burger to my sister the minute I stepped inside our room. 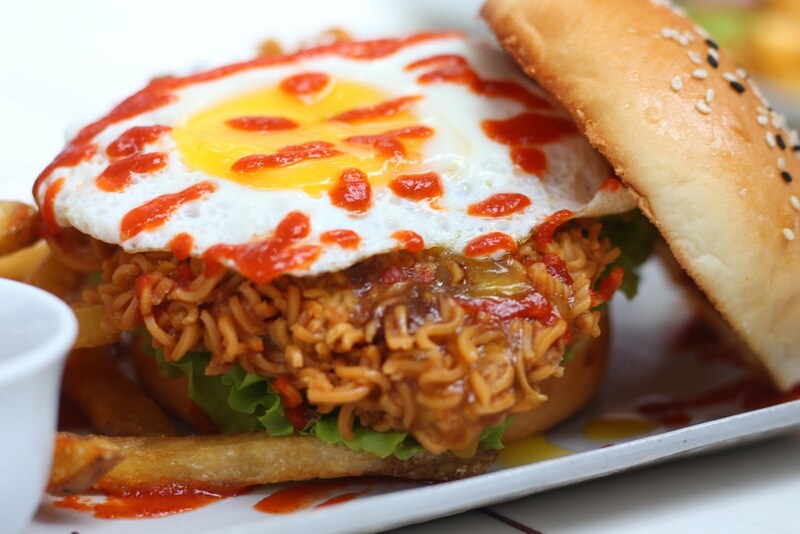 Chicken thigh fillet wrapped in Mi Goreng noodles smothered with Sriracha sauce, topped off with a sunny side up egg and drizzled with more sriracha sauce. I normally move on from a dish that has the smell of hot sauce, but Gilt's Mi Goreng was surprisingly addicting to me. The Sriracha sauce blended so well with the chicken fillet and the noodles, plus the noodles gave the "patty" a little crunch that stepped up its effect on the satisfaction of my senses. The Drunken Umami is owner Gian's favorite. 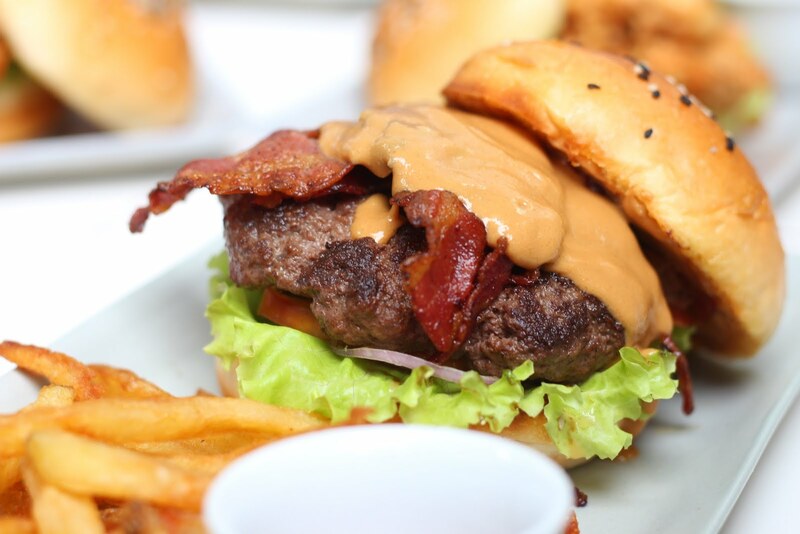 It's a mix of 150g New Zealand Angus beef, katsuobushi, beer cheese sauce, lettuce, tomatoes, and bacon jam. I thought I wouldn't have more than a bite of this alcohol-infused burger, but it actually wasn't so bad after all. The taste of the alcohol was perfectly concealed by the sweetness of the bacon jam, although you can still get a hint of it. 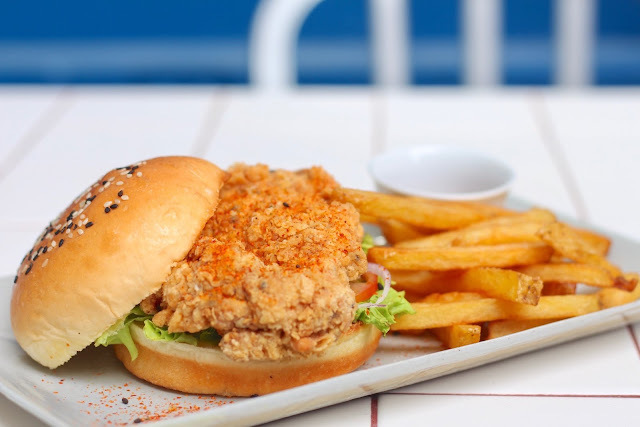 This Sydney beach culture inspired burger involves a classic combination of sweet and spicy, with pineapple slice and chicken thigh fillet in Peri-peri sauce. 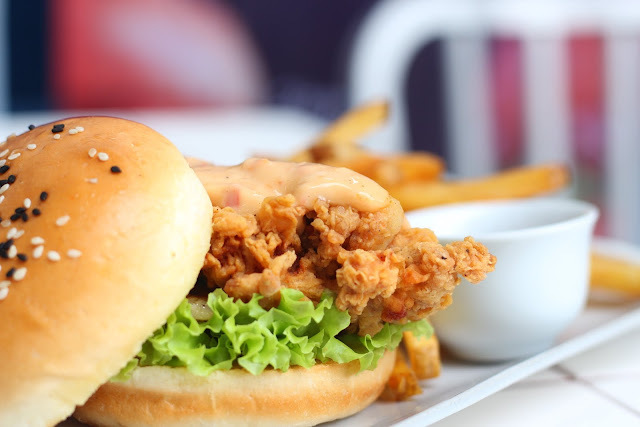 In terms of spice level, this burger means business, so it is highly recommended for those who love spicy food. Do you think you can handle it? Cause I can't. A sweet and savory, not-so-common pairing of bacon and peanut butter, 150g New Zealand Angus beef, lettuce, tomatoes and red onions. I haven't really thought about eating peanut butter with anything other than bread or oats, much less have it in my burger. It might take you more than a bite to realize that it doesn't taste as weird as you thought. Those who are looking for an alternative yet delicious, not to mention healthy way to eat burgers have a special place under Gilt's roof with this burger. 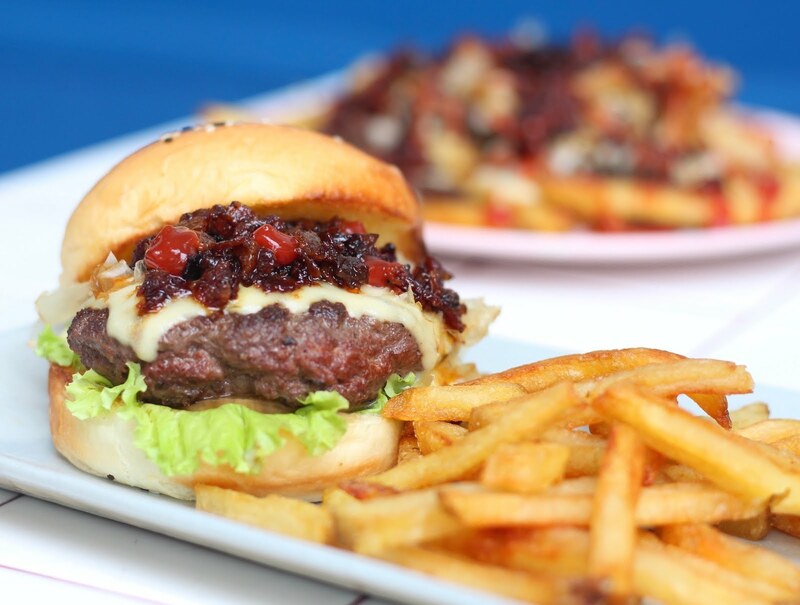 Made of puso ng saging and mushroom coated with bread crumbs, topped with fresh and crunchy coleslaw with their house "saucy sauce", lettuce, tomatoes and red onions, the braveheart burger isn't difficult to love. 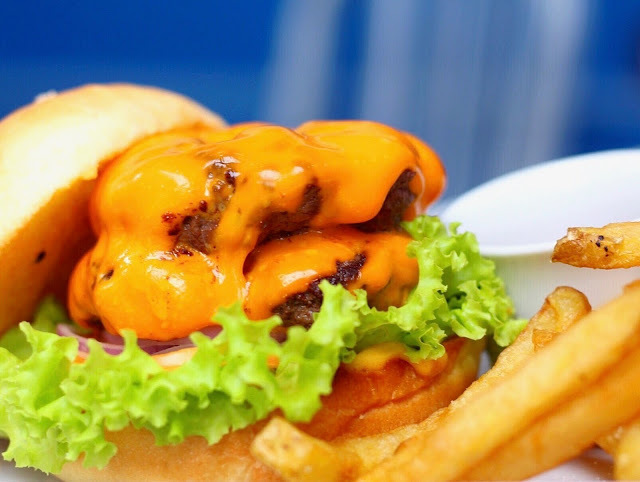 The difference in the texture of the patty definitely gives you a clue that this isn't an ordinary burger, but its taste will make you throw your care out the window and finish it anyway. 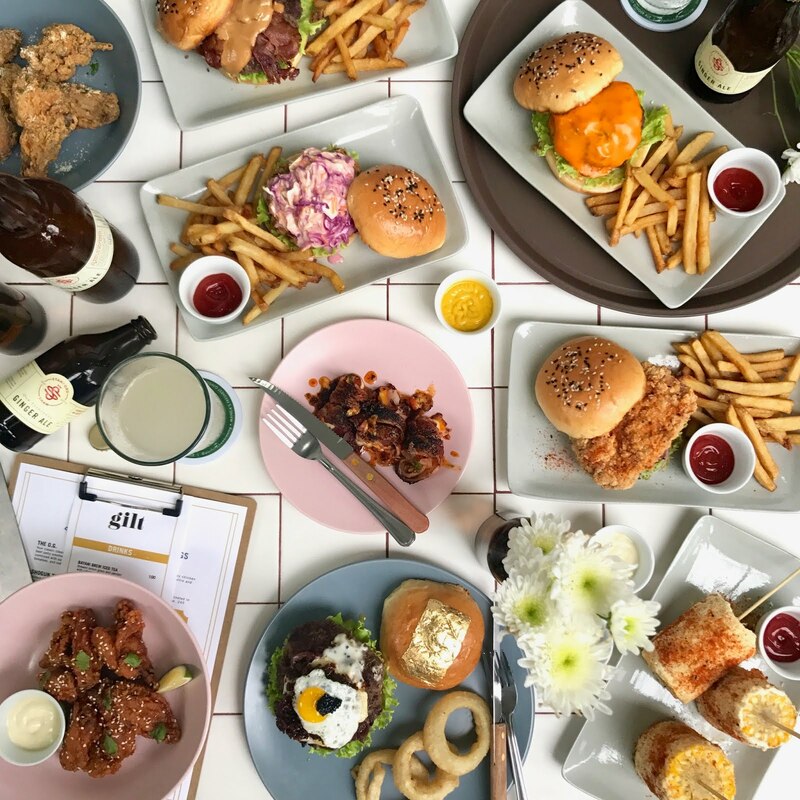 If you're looking for the ultimate burger experience and have the money to spend, then you are in for a treat with the Gilt Burger. Huge 200g New Zealand Angus beef combined with colby jack cheese grilled to a juicy perfection, topped with red onion caramelized in red wine, brie cheese, bacon jam, truffle mayo with black caviar, quail egg, lettuce, tomatoes, and sealed with a 24K edible gold leaf on the top bun. It's ridiculous just to think about ordering this, but it's even more ridiculous not to give it a shot. Just take a look at the grand lineup of this burger's ingredients and you'll totally get what I'm saying. I wasn't able to take a photo of this burger, but it's a simple and timely one. Gilt used the pumpkin, a popular Halloween symbol, as a main ingredient in their smashing pumpkin. It's new, and as Barney Stinson will say: "new is always better". I loved the slightly sweet taste of the pureed pumpkin sauce. It's not the best sauce I've had from Gilt, but it works. 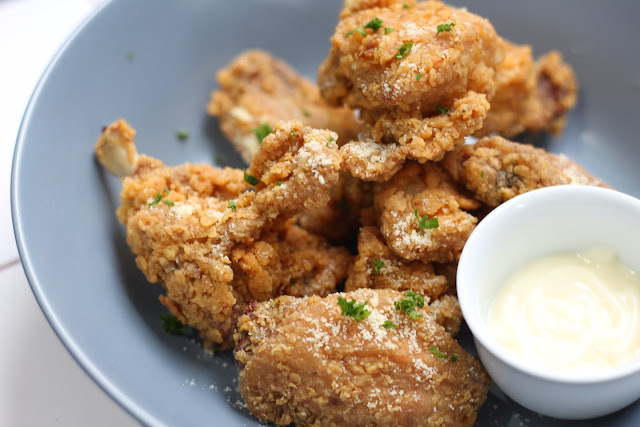 Crispy deep-fried chicken coated in garlic and parmesan cheese. I liked their chicken. It was crispy and had the right amount of seasoning, although it lacked the strong garlic and cheese taste that I was expecting. 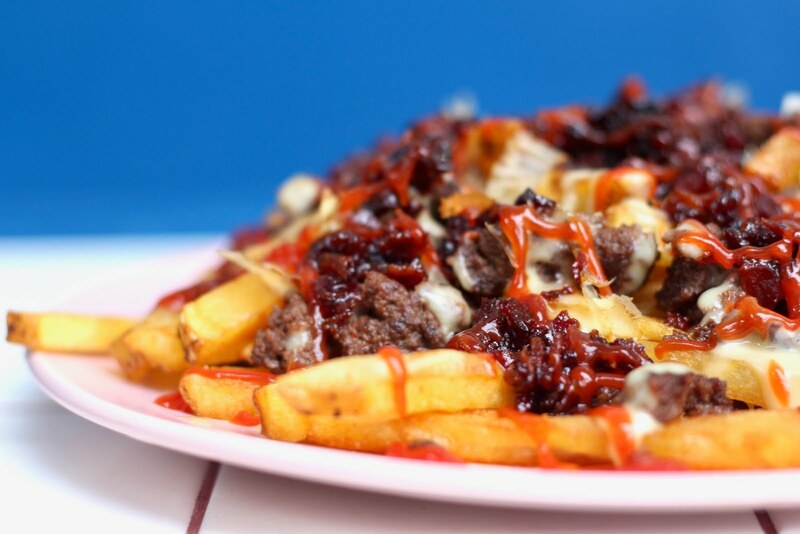 Look at all the toppings piled on top of the Gilty fries!!! 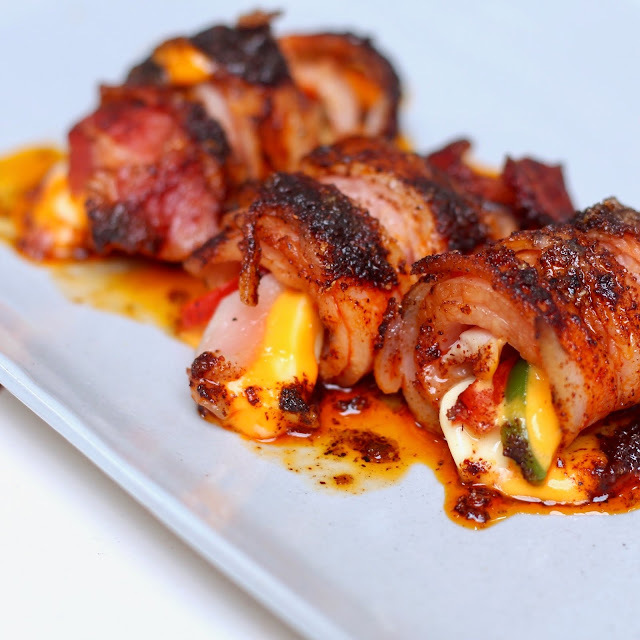 The Samurai cob is Gilt's take on a Mexican style corn. It's covered in parmesan cheese, sour cream, Japanese Togarashi spices, and butter. I can't say that I favored their corn among all the appetizers we've tried, but it sure wasn't bad. It's just hard to finish a serving because of all the cheese. Thick cut onion rings in beer batter, deep-fried to a crispy finish. I'm not a fan of thick cut onion rings so this was okay for me, but the fact that the onions weren't too pungent made me survive eating a few pieces. 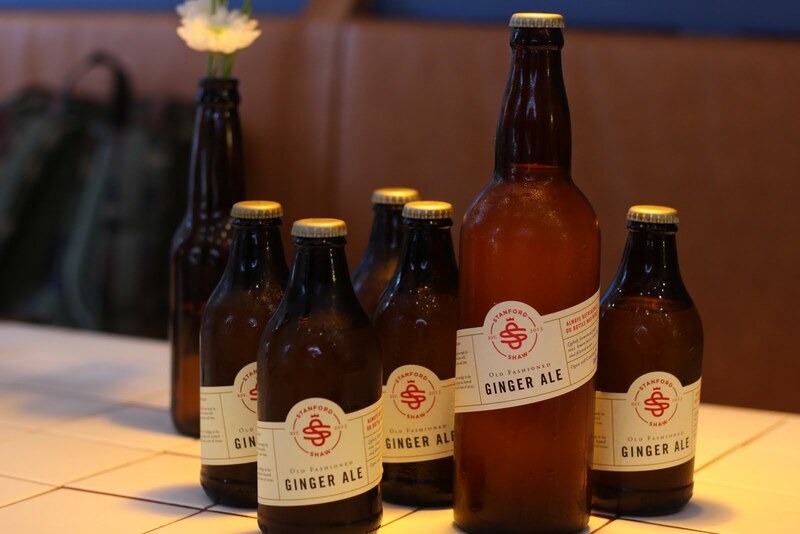 GILT also has Standord Ginger Ale drinks to go with your burgers. Gastronome (noun), according to Merriam-Webster dictionary means a lover of good food. My name is Mida, short for Andromida. Hence, gastronomida is me, the lover of good food, making every calorie count. My New Favorite Kind of Ice Cream: Elait! 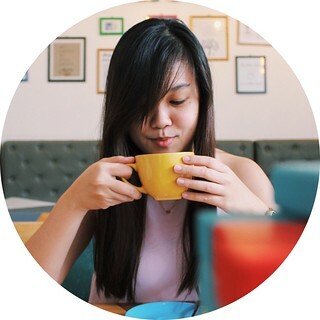 Overdoughs Opens its Second Branch in Manila!